EXCLUSIVE! It's cooler in the shade. Calming blue-green cools you in this loose-fitting swing dress, the lightly puckered linen skims you, as light as a breeze. Two patch pockets add visual interest. 36" long. Linen/rayon blend features slight slubbing for a softer, updated version of seersucker. Machine wash. Made in USA by Color Me Cotton. Sizes XS-XXL. 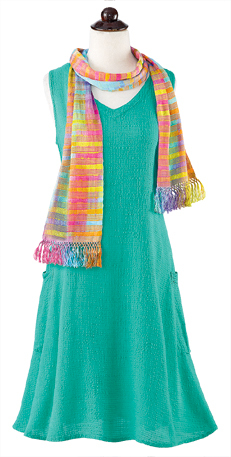 Shown with our Bamboo Handwoven Scarf, item B30095, in Rainbow.